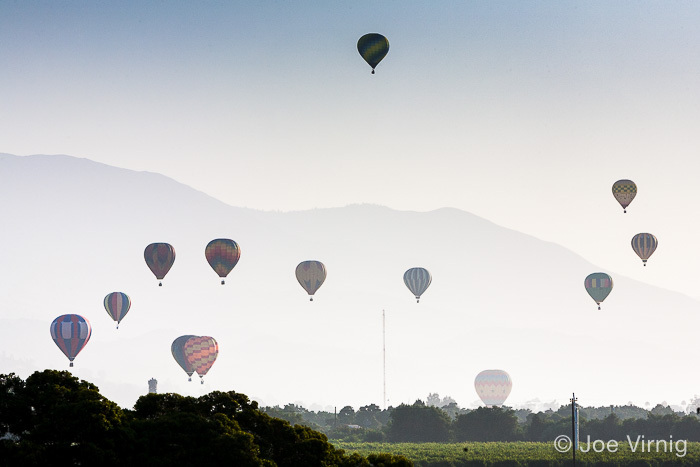 I love, love, love Santa Paula’s Citrus Classic Balloon Festival. I was excited when the first Citrus Classic balloon festival was announced in 2008. I knew I had to be there. 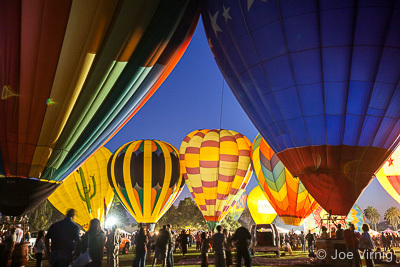 I’ve always wanted to see the famous Albuquerque Balloon Festival and now I had chance to experience something similar on a smaller scale in my own Ventura County. 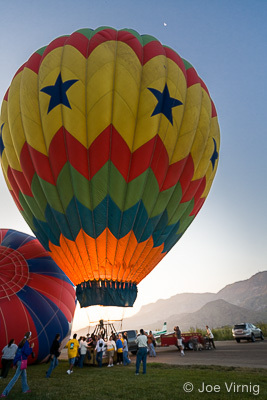 I could hardly wait to see hot air balloons take flight over Santa Paula, California and the picturesque Santa Clara River Valley. 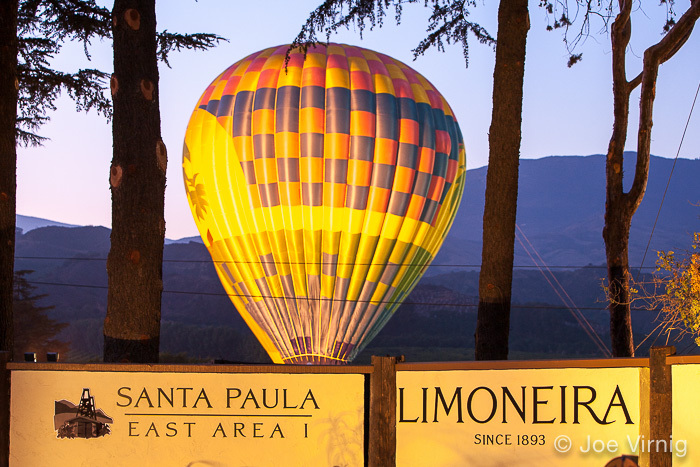 The organizers of the Santa Paula Citrus Classic Balloon Festival would probably like me to mention there are lots of activities to enjoy for the entire family—food, art, classic car show, live music, balloon rides and more. All true, or course, but for me it’s all about the balloons. There are two events in particular that I (and you ) have to see. The first is the “balloon glow” on Friday night. With a little luck, the afternoon breezes will have stilled at dusk and dozens of balloons will be inflated and illuminated by the flames of their burners. The balloons are tricky to photograph since the brightness of the flames lighting the balloon’s interior changes and much of the time they are not lit at all. Fortunately with digital cameras you don’t have to worry about wasting film so take lots of photos to get a few really good ones. Don’t forget to take a tripod. The exposure times will be too long for you to hand hold a camera and get sharp photos. If you can, turn off the camera’s flash. Even if the flash were powerful enough to light up the balloons (and it isn’t), it is the quality of the light coming from inside the balloons that you want to capture in your photographs. The other “must see” event is the mass ascension of balloons on Saturday morning. You’ll have to get up early, especially if you’re coming from out of town. You can sleep in some other Saturday. 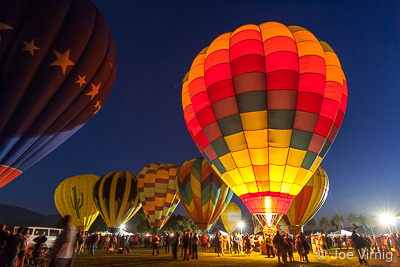 The sight of 20 or more brightly colored hot air balloons rising in the sky is not to be missed. Have your camera ready to go. When the balloons, one after another, take flight it happens so fast you’ll want to have your camera out ready to go. Take as many photos as you can. Experiment with composition, different angles, different backgrounds, but work fast. You wouldn’t think the balloons would move very fast, but they’ll be floating off in the distance after 5 or 10 minutes. That’s the point when I race to my car so I can in front of them and get another change to take pictures. It would be a good idea to have already determined where your next vantage point is going to be. In 2008 I chose the Briggs Road overpass on the 126 Freeway but it turned out I had really gone too far since balloons started landing long before they made it that far even though the designated landing area was well past where I was. That’s just the way it goes sometimes. I missed the 2009 Citrus Classic Balloon Festival, and in 2010 poor visibility Saturday morning prevented the ascension entirely! I’ll be taking my own advice and be scouting out a new vantage point next week. 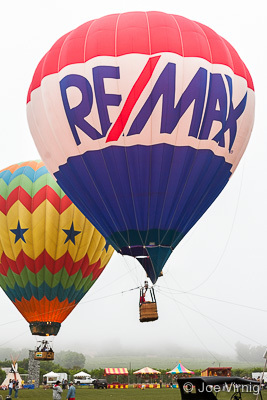 And though I missed the balloon ascension last year, as a consolation I was one of the very few who got to ride in the famous RE/MAX balloon. One of the minor perks of being associated with RE/MAX! Times: Friday, July 30, 5 p.m. - 10 p.m.; Saturday July 31, 5 a.m. - 10 p.m.
Visit www.citrusclassicballoons.com for the full schedule, ticket prices, maps and directions, parking information and other details.